Home RxTV Rx Rants BOSTIN LOYD RIPS "SCAM" TRAINING PROGRAMS! Boston Loyd goes OFF on bodybuilding social media, in particular those promoting training programs that - as Loyd claims - contains information that users can view for free on such sites as Bodybuilding.com and YouTube. Plus, Loyd rates his chances against other aspiring pros, and breaks down their strengths, weaknesses, and who he thinks will obtain their pro card in the near future! It's Bostin Loyd, guest ranter, on RXMuscle.com. RX Rants are powered by RedCon1. 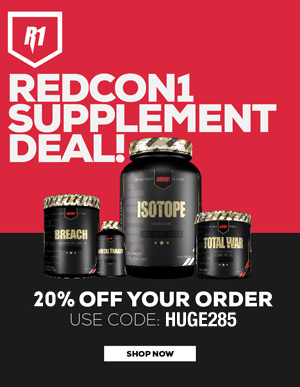 SAVE 20% on RedCon1.com by using promo code HUGE285.